TOP Singapore eye surgeon Donald Tan has become the first non-American to be elected to head the renowned Cornea Society, an achievement that reflects the advances Singapore has made in cornea transplants. The 37-year-old society, based in the United States, plays a pivotal role in unveiling new techniques and treatment to eye surgeons around the world. Its annual scientific meetings draw some 15,000 participants from around the world and its monthly Cornea journal is seen as the authority on the latest developments. Professor Tan, 52, medical director of the Singapore National Eye Centre and chairman of the Singapore Eye Research Institute, attributes his new role to the Republic's prominence in cornea transplants. Although its 350 transplants a year are relatively few compared to the 45,000 done each year in the US, these are 'high-end' operations that use new forms of transplant techniques.Only one in five who need a transplant suffers damage to the entire cornea. Still, surgeons in most parts of the world would remove and replace the cornea even when only a part of it is damaged. As a result, the rejection rate is 10 per cent. Surgeons here, however, generally remove and replace only the damaged part, reducing the rejection rate to 3 per cent or less. Singapore's leading-edge practices have drawn foreigners from as far as Russia and Australia, who form half of the cornea transplant patients here. 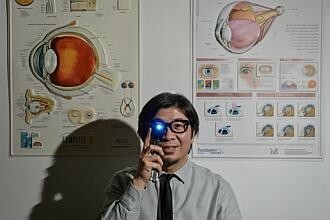 Prof Tan, who has been at the forefront of cornea research, had a hand in improving some of the techniques now used worldwide. Singapore, he said, pioneered several forms of cornea transplants, such as one involving the removal of the old cornea in two stages. This increases the chances of complete removal from 80-85 per cent to 94 per cent. The complete removal gives the recipient of a new cornea perfect eyesight. 'This is now a well-established surgical technique which I routinely teach at various corneal transplant courses' in the US, UK and other countries, said Prof Tan, who is also professor of ophthalmology at the Yong Loo Lin School of Medicine at the National University of Singapore. He also invented surgical instruments that make procedures easier. Some carry his name, such as the Dalk (Deep Anterior Lamellar Keratoplasty) Tan Scissors. Dalk is for people with a damaged front layer, where replacing it carries no risk of rejection as it is all collagen with no living cells. Another procedure, where only the inner layer of living cells are replaced, uses a piece of equipment called the Tan Endoglide, which has helped to reduce the rejection rate from 10 per cent to under 3 per cent. The Tan Endoglide, which Prof Tan invented with another doctor, is made in Britain and used worldwide. Although there are rivals, it was the first to gain approval from the US Food and Drug Administration. Dr Jerry Tan, a prominent ophthalmologist in private practice, said Prof Tan 'is acknowledged as one of the very best experts in corneal transplant'.